As we celebrate Women’s History Month at Peirce College, we reflect back on one of the most tumultuous times in our country, and in modern civilization: World War I. This global conflict from a century ago actually helped create the shift from women largely being homemakers, to filling jobs that were critical to the country – many of them created specifically because of war time needs. In addition to women entering the workforce in record numbers, they also began taking college courses in numbers not previously seen. Peirce proudly welcomed these women and played an important part in preparing this American civilian army to fill these positions. Heeding the calls from former President Teddy Roosevelt during the 1917 Peirce commencement address, in which he stressed the need for civilian participation, Peirce quickly mobilized. The college, which at the time had recently been renamed Peirce School of Business Administration, quickly initiated a number of special programs and activities to help the country face its national emergency. Among these programs were Peirce’s specialized War Courses. “These focused, intensive programs prepared America’s working army to support the country at home by giving them the skills needed to fill positions in government, at the Red Cross, and clerical positions in the draft depleted private sector,” says Bart Everts, the Reference and Instruction Librarian at Peirce College. Courses like typewriting, calculating, and business arithmetic - cutting edge and in-demand at the time – ran from 10 – 30 weeks as well as offered courses to students during the summer. Stenographers in particular were in huge demand and Peirce offered several courses to help fill this gap. “The courses were thorough, but able to quickly get women out and filling these critical positions,” says Everts. With husbands and sons now overseas, many of these courses were flexible, offering day or evening classes as a way to accommodate busy working women. 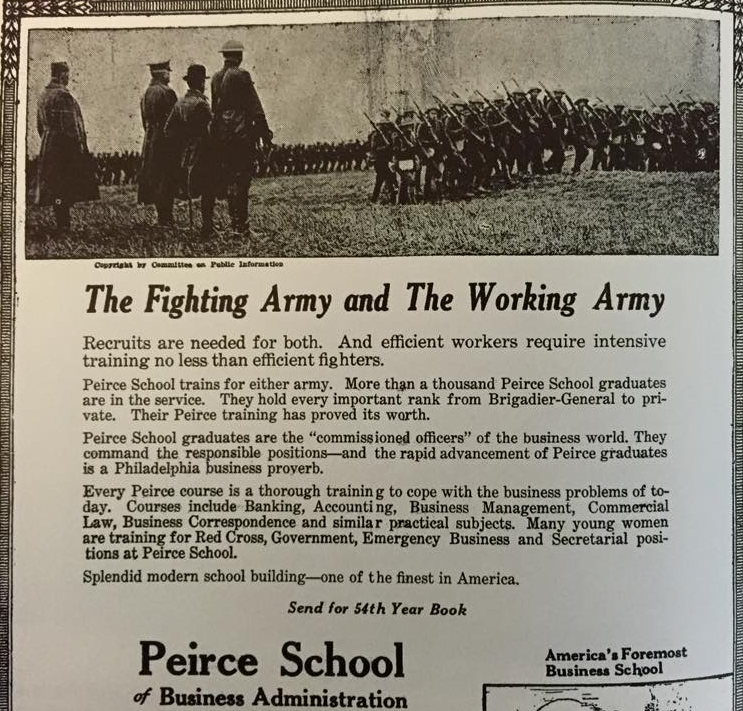 Though Peirce saw a significant increase in enrollment by women, these courses were also extended to local branches of the Armed Services, such as the Army Ordnance Field Service, and Naval Reserves to train war time recruits in typing and other modern military bureaucracy related roles. By the end of the war, it became clear that women were not just “fill in” workers while men were overseas fighting, but skilled workers that would continue to play an important role in the nation’s workforce. At Peirce, in the nearly 100 years since the Great War, women have continued to make up a large part of the student body and today are responsible for over 70% of total enrollment.